Heat oven to 350°F. Line large cookie sheet with cooking parchment paper or spray with Crisco® Original No-Stick Cooking Spray. Separate dough into 5 rolls; reserve icing. Unroll each roll into a strip; thread each strip onto wooden skewer. Place on cookie sheet. Bake 13 to 19 minutes or until golden brown. Place piece of waxed paper under cooling rack. Transfer skewers from cookie sheet to cooling rack. Meanwhile, in 2-quart saucepan over low heat, heat caramels and milk, stirring occasionally, until caramels are melted. Place pecans on piece of waxed paper. 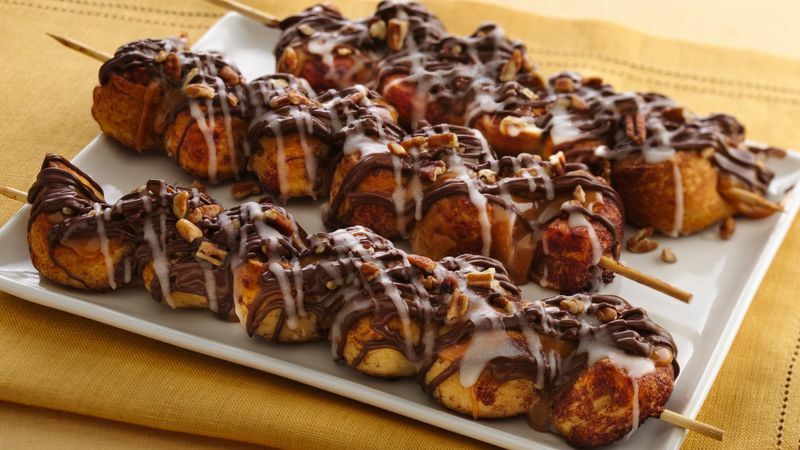 Generously drizzle caramel mixture lengthwise over cinnamon roll strips; roll in pecans. Return to cooling rack. In small resealable freezer plastic bag, place chocolate chips and oil; seal bag. Microwave on High 15 to 25 seconds or until softened. Gently squeeze bag until chocolate is smooth; cut off tiny corner of bag. Squeeze bag to drizzle chocolate crosswise over cinnamon roll strips. Place reserved icing in small resealable freezer plastic bag; seal bag. Microwave on High 10 seconds or until softened. Gently squeeze bag until icing is smooth; cut off tiny corner of bag. Squeeze bag to drizzle icing crosswise over cinnamon roll skewers. Serve warm.